Countercurrent chromatography (CCC) is a separation technique in which the stationary phase is a liquid. The mobile phase is also a liquid, so biphasic liquid systems with at least two solvents are used. Centrifugal fields are used to hold the liquid stationary phase while pushing the liquid mobile phase through it. This comprehensive reference covers recent advancements in the two types of CCC machines: the high speed CCCs without rotary seals and with coiled spools and centrifugal partition chromatographs (CPC) with rotary seals and interconnected channels. 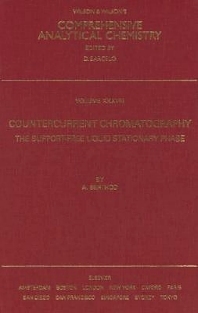 Written by leading international experts in the CCC field, the book focuses on the liquid nature of the stationary phase: giving newcomers the basis to do CCC efficiently and rapidly; explaining the art of obtaining a biphasic liquid system; describing the flow patterns in both CPC and high speed CCC machines; showing possible other uses of a liquid stationary phase; presenting a wealth of applications in the separation of organic, pharmaceutical and inorganic mixtures; and demonstrating that even supercritical fluids can be used in CCC.